Normally Windows DOS Prompt opens in Root directory only. Usually, the Primary drive(root) is C and command prompt is open from C drive like C:\. Though by default DOS opens in root drive only, we can make it open from any drive as we need. For a normal user, this article may not be very useful but if you want to run any script on DOS which are directory specific, this tutorial will help you. We can change the DOS working directory by following any trick from a list of methods. There are registry tricks, CMD command, Explorer trick etc to change the DOS root directory. In order to change your current DOS directory from C drive to D, use any of the methods listed below. 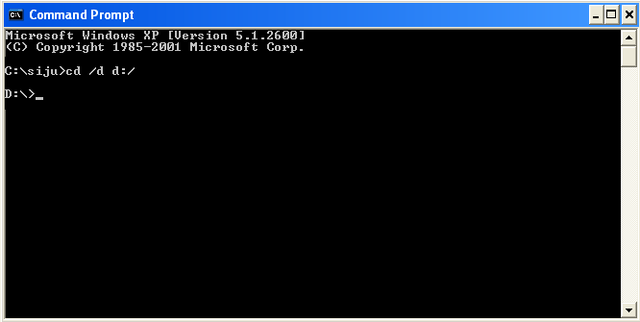 At first, we can use simple DOS trick to open Command Prompt in any directory. To change the working directory from C drive to D drive from DOS, follow the steps below. Now your current working directory will be D drive. This is one of the simplest methods to change C to D drive by using DOS. 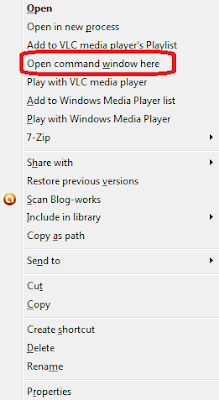 This method works in most of the Windows versions like Windows 8, 7, XP etc. Another simple method to open CMD in any drive is explorer method. You can use this method to open DOS Prompt in Windows 8 and 7 without any additional tweaks. So personally I prefer this method to start DOS Window in any folder on Windows 7 and 8 computers. You can open DOS Prompt by using this method in any working folder on Windows 7 and 8. There is no restriction to use this method to start it in any folder. You can even open it on any subfolders in any directory. Normally you cannot get an option to start DOS Prompt in any folder on XP computer as you see on Windows 8 and 7 computers. However, you can start it in any drive (C, D, E, F, etc..), using a simple registry tweak on XP computer. This registry tweak will allow you to run it in any folder by a right click on it. Playing with the registry is critical and you are advised to create a backup of your registry before performing the steps below. Create a new key called Command Prompt. Now right click on any folder on Windows XP computer and check if you have the option to start Command Prompt. By using that option you can change it from C drive to D drive.